ALS, also known as Lou Gehrig's Disease, is 100% fatal and has few treatments to improve the quality of life. We are committed to helping more people understand the impact that this devastating disease has on individuals and families nationwide. 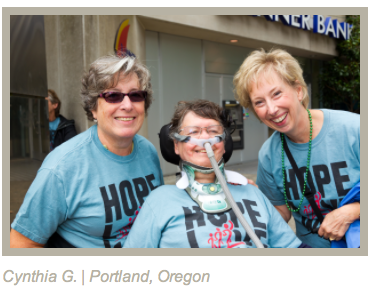 During ALS Awareness Month, we ask that you join us: speak up now to give hope. Tell Your Story, Sign up, Advocate. Telling your story is a critical part of raising awareness about Lou Gehrig's Disease. Everyone can help, whether you're a person living with ALS, family member, friend, or concerned individual. Sign up to receive important and timely information from The ALS Association and learn how you can make a difference. Sign up to become an advocate. We need your voice to make a collective impact on lawmakers regarding important issues facing people with ALS.